Director Ram's next film Peranbu performed well at international film festivals. The audio of the film released yesterday. A lot of stalwarts from the industry were present at the event. Here is what the celebrities had to say about the film. 1) Mammootty: "It is a good team. Ellarume nalla kashta pattu ozhachirukanga. Padatha paathavanga nariya per pesitanga. Avanga nariya per kitta pesuvanga. Inga paaka poravanga pesuvanga. Inga nariya per kitta pesuvanga. Apdi pesi pesi, indha padame oru pesa padum padam aa maarattum. Sandhosham." 2) Bala: "Balu Mahendra sthanathila inga vandhe aaganum nu Ram sonnadhala ivandhurken. Idhukku munnadi pesina ellarume, naan manasule vechirndhadhu ellame pesitanga. Ippo naan pudhusa edhachu pesinen na, nee kelambi po maari saththam poduveenga. Adhunala, avanga pesinadhu ellame naan pesinadha irukatum. Vaazhthukkal, nandri." 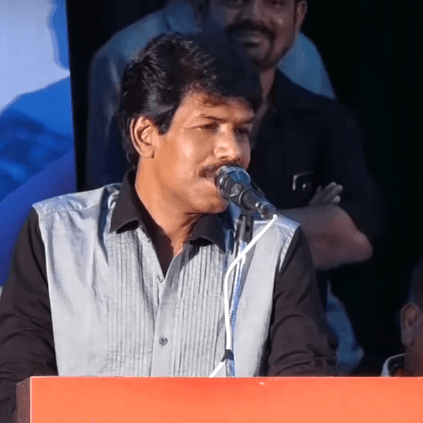 BIGG BOSS SENSATION JOINS BALA'S NEXT! Director Bala's next titled Varma is in the pipeline with actor Dhruv Vikram playing the lead and debutant actress Megha playing the female lead. It is a known fact that the film is a remake of one of the most popular Telugu films Arjun Reddy. We had earlier reported that the makers shot the climax scenes of the movie at Semmozhi Poonga. "Bala Sir is amazing! He’s a perfectionist and I have learned a lot from him every single day. Dhruv is super cool and a sweet guy so, it was easy for me to work with him. Overall, it was a great experience being a part of this film." People looking for online information on Bala, Mammootty, Peranbu, Ram, Yuvan Shankar Raja will find this news story useful.